Black Bean and Turkey Enchiladas are my go-to recipe this month. They come together so quickly and taste delicious. They are also inexpensive and very filling. These may be some of the BEST enchiladas I've had in a while. We have been trying to find some healthier recipes lately, and came across an enchilada recipe that had ground beef and back beans. They were so delicious and filling, that my husband could only eat one. They only required a few ingredients, and take minutes to make. First you cook your ground turkey in a non-stick pan. I like to rinse mine once it is done cooking, just because the grease from the meat is a little gross to me.Once the ground turkey is cooked, add the washed and drained black beans. You don’t have to drain them, but it might make your enchilada’s a little soggy if you don’t.You can also use any bean you would like. I have only tried black beans, but pinto would be delicious as well. Again, I would wash and drain whatever bean is used. We like to flavor our meat by using a taco or fajita seasoning packet. I used a taco seasoning packet on mine. 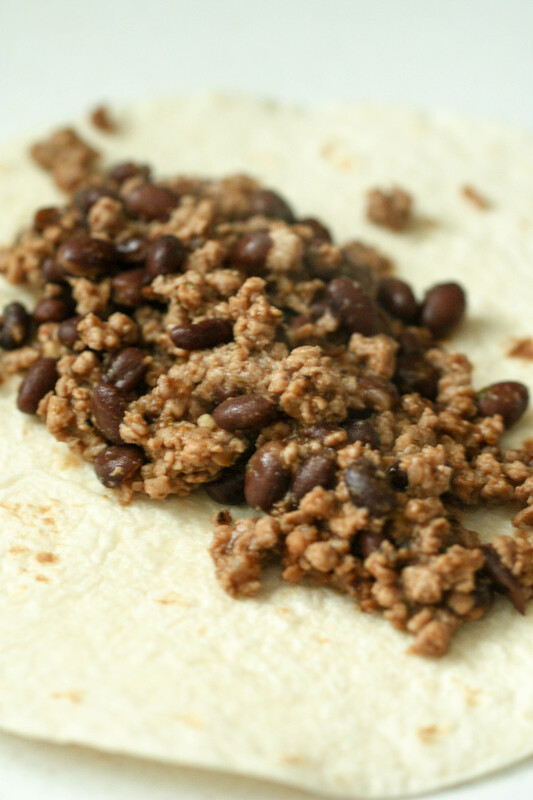 Sprinkle it over the cooked ground turkey and black beans until it is evenly mixed. 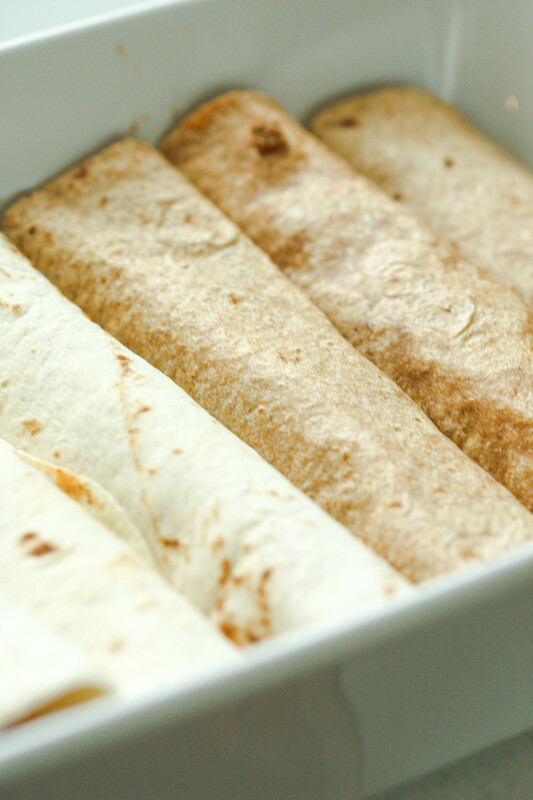 I try to opt for a more healthier recipe so I went for the whole wheat tortilla’s, but my husband prefers white flour tortillas. You could use any tortilla for this recipe, they would all taste great, it is just what you prefer. Place about 1/2 cup of the mixture in each tortilla, and roll it up. Place each tortilla in a sprayed 9×13″ pan.Once all the enchilada’s have been rolled up, pour about 1/4 cup of enchilada sauce over each one. 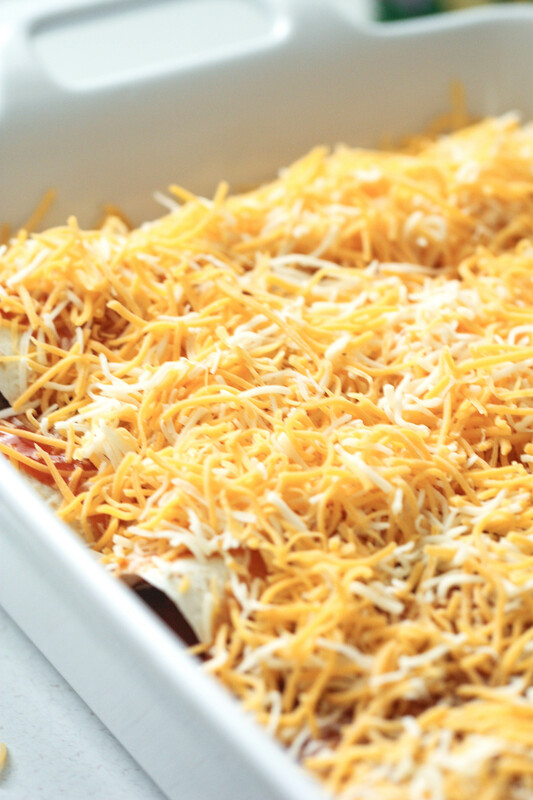 Sprinkle your favorite cheese on top of the covered enchilada’s. I used a Mexican blend of pre-shredded cheese. Garnish with your favorite toppings such as shredded lettuce, olives, tomatoes, sour cream, green onions, avocado, etc. Eat warm and enjoy. Could i make these with ground beef? Ground beef is a little more inexpensive than ground turkey, and many people prefer the taste of ground beef as well. In this recipe you can’t really tell it is ground turkey. However, if you were wanting to use beef in this recipe, you most definitely could. Beef cooks just like ground turkey, and no other areas of the recipe need to be fixed or changed. 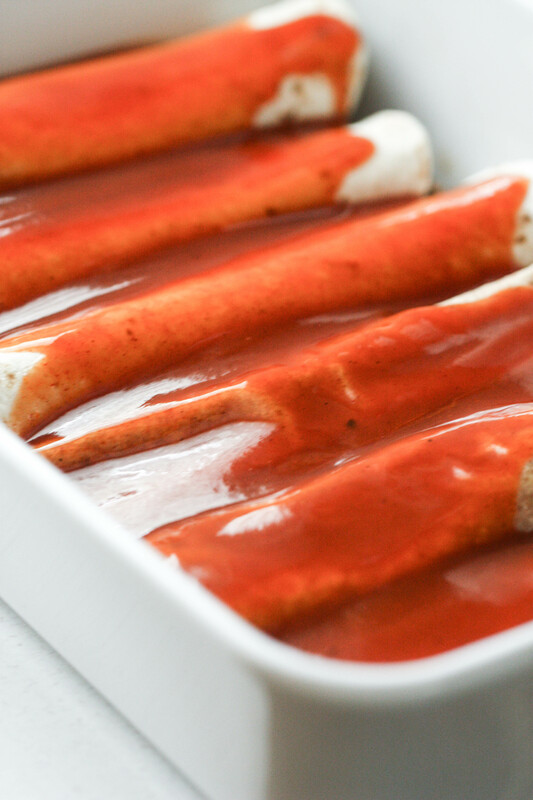 looking for more enchilada recipes? Heat stove to medium high heat. Spray the pan with nonstick cooking spray. Add the ground turkey and cook until there is no more pink, and it is cooked all the way through. Then add the washed and drained black beans. Add the taco seasoning and mix until well combined. Place about 1/2 cup of the mixture down the center of the tortilla. Roll up the tortilla and place in a a sprayed 9x13 pan. Pour enchilada sauce evenly over the enchiladas. Sprinkle the cheese over the enchiladas. Place in oven and broil for 3-4 minutes or until the cheese is melted and the tortilla's begin to brown at the edges. We like to garnish these enchiladas with tomatoes and shredded lettuce. How long do you bake this if you make it ahead and leave it in the fridge? Where they will be in the fridge, you may want to heat them in the oven at 350 degrees for about 15-20 minutes or until heated through. If you were to just broil them they may not be heated all the way through.